The suburb Mestre has the second largest railway station in Venice. It is a big suburb of Venice on the mainland. The largest railway station in Venice is called Venezia Santa Lucia and is a terminus station on the island of Venice in the historic centre of the city. Most trains from all dircetions stop in both stations. 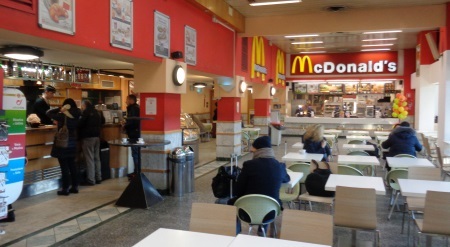 Many employees of thousands of hotels, restaurants and shops in Venice live in Mestre. A lot of tourists also stay in one of the hundreds of hotels in Mestre. Since there are no roads on the island of Venice, all these people use public transport every morning from Mestre to Venice and back again in the afternoon or evening. There are local trains from Mestre to Venice, several bus lines and, since 2015, a new tram line. Although about 10 long trains per hour run from Mestre to Venice, the capacities at peak times in the season are often insufficient. Also buying a ticket at Mestre station can take a long time. Many tourists stay overnight in Mestre, as the hotels are cheaper here than in the historic old town of Venice. In addition, you are quickly in the old town of Venice. This is especially true if you choose one of the many hotels around Mestre station. A good overview of hotels in Mestre can be found on www.Booking.com. Our favourite is the A&O Hotel and Hostel. It is close to the station, new and for Venice cheap. As we said, trains from Mestre to Venice run frequently and irregularly, about every 3 to 10 minutes. Local trains depart from various tracks at Mestre station. You can see on many monitors on which platform the next train leaves. Tickets are very cheap, a one-way ticket costs 1.25 Euro. At peak times, especially between 10 am and 1 pm in the season, Mestre station is often as crowded as a football stadium. Then it is a real challenge to buy a ticket to Venice and get a standing room in a train. The journey time between Mestre station and Santa Lucia main station is only 9 to 10 minutes. At Santa Lucia station, you can take the ferry or walk through the historic centre of Venice. If you are smart, you buy your ticket the evening before or during off-peak hours. For example, if you arrive at 11 a.m. during the season, you can pick a waiting number at the ticket counter, which may be called an hour later. The situation is not much better at the ticket machines.. The waiting lines can be very long, often more than 20 people are waiting at each machine. There is no trick to get the ticket quickly. It might be a good idea to take one of the buses to Venice, which stop near Mestre station (for example line 2). Tickets are available in the tobacco shop and kiosks at or near the train station (only 1.50 per person per day). There is usually no queues in the tobacco shop, as no train tickets are sold here. Important: After purchasing the ticket you must always stamp it in Itlay in the orange machine on the track, otherwise it is not valid. The ticket selling machines are quite easy to use, as they can be converted to English. Not all machines accept cash, some take only credit cards. 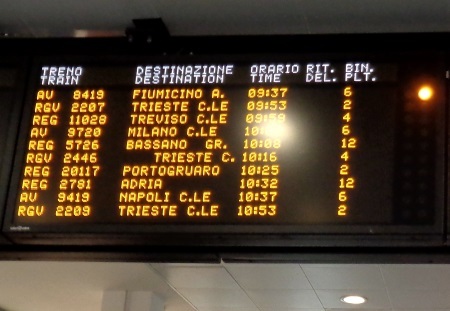 From Airport Venice you can not reach Mestre train station by train, but there are frequent airport buses. These bus tickets can be purchased on the Internet on an English-speaking website. The bus station is right next to the station. You look at one of the monitors or the large display for the next train to Venice. There are also monitors for arriving trains, so you look for a screen on which "departures" is written. There you look for the next train to "Venezia". Now it is important that it is a local train, not an Intercity (IC), Eurocity (EC) or Eurostar (ES). To the right of the trains on the monitor is the number of the track. Number 1 is right next to the station building, you go through the underpass to all the others. This all sounds a bit complicated, but is essentially no different than in England. Caution: At Mestre station, some monitors only show trains that do not run to Venice. Of course you can not only go by train from Mestre to Venice. Mestre station is a large long-distance station, almost all trains departing from Venice Santa Lucia stop here. The journey aftre Mestre continues in many directions, for example to Bologna (and on to Florence and Rome), Verona (and on to Milan, Turin and Munich) or Trieste. There's a big McDonald's and some bars that also sell sandwiches. The shops in Mestre station are quite expensive. For example, a bottle of Coca-Cola 0.5 liters costs 2.50 euros. Drinks and food should be bought in advance if you have a long train ride ahead of you. The McDonald's has normal prices. Otherwise, in the "Stazione Venezia Mestre", as the station is called in Italian, you will find a newspaper shop, a book shop and some small souvenir shops. In the vicinity of the station you will also find some rather inexpensive restaurants (asian food, kebab etc.). The toilets at Mestre station are on platform 1 (clean, 1 Euro). There are toilets on all long-distance trains and most local trains in Italy. 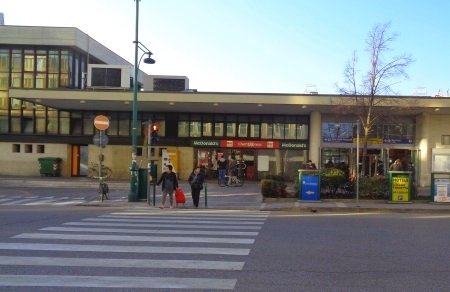 Busses to both airports (Venice Marco Pola and Treviso) stop near Metre train station. The suburb of Venice Mestre actually looks more like a city of its own and has a nice centre with a pedestrian zone with many shops, restaurants etc. Mestre has almost 200,000 inhabitants, many mor than Venice. The center of Mestre is less than a kilometer away from the train station. You walk out of the station and straight ahead. You can also use the tram, which stops under Mestre main station. There is only one tram line, so you can only go in the wrong direction. A single ticket costs 1.50 Euro. If you have a day ticket for the water buses, you can also use the tram and most of the buses in and around Mestre for free (not to the airport, of course also with the 48-hour ticket, the 72-hour ticket and the week ticket).